Long the inviolable symbol of a wild and pristine Temagami, Maple Mountain's slopes will be logged this winter. In preparation, MNR in Kirkland Lake is preparing to approve, within weeks, the construction of the access road for Domtar Inc.'s cutting crews. Jack pine will be cut (in blocks known as 100 and 101) on steep slopes overlooking (and outside) two parks: Lady Evelyn-Smoothwater Wilderness and Makobe-Grays Waterway. Domtar is one of Canada's largest forest products companies. Its 2003 revenue topped $3.5 billion. Maple Mountain became the focus of a political storm in 1972 when Ontario proposed to build a destination resort on it. That marked the start of the first environmental war. was an ancient aboriginal burial site. In 1973, the mouse roared and asserted a land claim, killing the development. In 1983, the Lady Evelyn-Smoothwater Wilderness Park was created, but the northern portion of the mountain, where the logging will occur, was left outside its protection. The contentious Official Plan of the Municipality of Temagami, which encompasses Lake Temagami, is expected to go into force in a few weeks. At that time, according to Ontario Municipal Board (OMB) spokesperson Frances Rowe, the board will render a decision on the challenge to the plan by the Lake Temagami Group, a group of Lake Temagami property owners. The decision will contain new procedures for completing the plan and the final, amended version of the Official Plan. The OMB held two days of preliminary hearings in August. The parties came to an agreement on new amendments to the plan and to a new set of procedures, to be administered by the municipality, for resolution of lingering disputes. The agreement forestalled a full, and expensive — involving lawyers and consultants— hearing before the OMB. A hearing could still materialize later if the municipality's implementation of the decision is challenged. The parties were the Municipality of Temagami, Lake Temagami Group, Temagami Lakes Association (largest Lake Temagami land-owners group) — supporting the Municipality's plan — and the Ministry of Municipal Affairs and Housing. In 1998, the lake and the Township of Temagami merged, along with other unincorporated townships, into the Municipality of Temagami. An Official Plan for the whole was required and the draft was completed five years later. The plan was approved by the Province of Ontario on April 8, but was then challenged by the Lake Temagami Group, which appealed the approval to the OMB. The Ontario Municipal Board is a provincial, quasi-judicial body that adjudicates disputes over municipal rulings. The Official Plan only governs private property in the municipality. Crown land is governed by the Temagami Land Use Plan, administered by the Ontario's Ministry of Natural Resources. Once Crown land is sold by Ontario, the new property falls under the Official Plan and any construction on it must conform to the plan. The content of the plan stirred up animosity and bitterness over the last several years among Lake Temagami property owners. The Temagami Lakes Association saw members leave and create two splinter groups, Lake Temagami Group (LTG) and Committee for the Preservation of the Temagami Wilderness (CPTWE). Strong disagreements arose over how much, and where, new development — commercial and private — would be acceptable. Ironically, members of all the groups held a common cause in the protection and severe restriction of development on the lake, divided only by a different vision of degree. 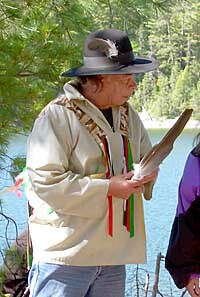 Elder Henry Anishnabie with eagle feather. The annual fall Changing of the Seasons gathering on Obabika Lake attracted 65 participants last weekend. The annual event, hosted by Nishnabai elder Alex Mathias, celebrated the fall equinox, a traditional gathering of the Nishnabai before they dispersed to their family lands for winter. Nipissing First Nation elder Henry Anishnabie led a Smudging Ceremony, Sharing Circle, and Tobacco Offering. It was followed by a feast and a sweat. Side trips went by foot and canoe to the sacred Grandparent Rocks, the Wakimika Triangle old-growth trails, Spirit Rock and Wakimika Lake. Guests came from Sturgeon Falls, River Valley, Nipissing, Temagami, Bear Island, southern Ontario and Wisconsin. The Minister of Natural Resources has announced a review of the antiquated Ontario Parks Act. "The Ontario Parks Act was written in 1954, to cover just 8 parks," said Wildlands League's executive director, Janet Sumner. "Now we have more than 600 parks and conservation reserves, but we still do not have a law that puts these areas out of reach of development, and which makes protection of species and habitats the priority in parks management." Temagami has not been immune to the Act's soft underbelly. Possibly the most glaring weakness is in the most protected area, Lady Evelyn-Smoothwater Wilderness Park, which has no protection against mining and a logging road runs down the middle. Wilderness parks are considered the crown jewels of the system. The recently created Bob Lake Conservation Reserve will have logging trucks driving through it. In 2002, an independent report called Wild by Law ranked Ontario's legal protection of its parks the weakest in Canada. Wildlands League has been battling for the upgrade since Mike Harris was in power. "Frankly, this would be quite inexpensive and could even save money if Ontario Parks staff no longer had to entertain development proposals," said Evan Ferrari of the Wildlands League. Natural Resources Minister David Ramsay said in May, "I want our legislation governing provincial parks to be the best ever for the province and one of the best anywhere." Open houses will begin in Timmins on September 22. The North Bay open house will be at the Best Western on September 23 and in Sudbury at the Ramada Inn on September 30. Brad Hall was elected president of the Temagami Lakes Association last Wednesday. He was optimistic about the future of the organization. It represents property owners on Lake Temagami, and has faced a membership decline recently. ""We want to be as inclusive as we can be and we've seen our membership increasing some." "There are really good people on the board and we have a superb relationship with the town," he said. He is expecting the TLA will further its relationship with two aboriginal groups, the Temagami First Nation and the Teme-Augama Anishnabai, which are nearing the end of land-claim negotiations. The TLA board of directors elects its officers after the annual general meeting. Hall replaced Ray Delarosbel. New logging plans for the west side of Temagami reveal more roads, encroachment into the wildlands and clear-cutting up to park and reserve boundaries. Logging, if approved, will enter an area — known a Block 11 — near Pinetorch Lake by way of a new primary road intended to eventually allow logging expansion up to the boundaries of Lady Evelyn-Smoothwater Wilderness and Solace parks. This is the heart of some of Temagami's remotest and most striking terrain. A bridge will be constructed over the Sturgeon River for future logging on the Hamlow Road. It will also mean upgrading the Portelance Road, which connects to a highway north of Sudbury. Sturgeon River will have clear-cuts within 200 metres of the river in Block 3. The plan was made public over the summer. MNR is seeking approval by early 2005 for the logging and new roads. The west side of Temagami has been licensed to Vermilion Forest Management Company, a consortium of logging companies. MNR in Sudbury is responsible for the Crown land in the plan. The ministry reports that hundreds have commented on other areas of the plan, but few public comments have been received on the proposals mentioned here. A man drowned Thursday on Cross Lake while swimming after his adrift powerboat. CBC Radio in Sudbury incorrectly reported that he was chasing his canoe. The 24-year-old Sundridge man was camped on an island with another man when the boat drifted free from their campsite in high winds. They swam after it but the victim disappeared under the waves, not far from shore, according to OPP in Temagami. The companion made it back to the campsite. He was stranded until Friday when he waved down a passing boat. Cross Lake is connected to Lake Temagami by a navigable channel. The body was recovered by police on Sunday. The victim's name has not been released. With MNR launching a recreational and protected-areas plan for Temagami, citizens' groups are asking for a reassessment of "the adequacy of the parks and reserves system in Temagami as a whole." The groups are alarmed that the ecological base, which is used by the tourism and recreational industries, has been "shrinking steadily over the decades." Earthroots, Wildlands League and Canadian Parks and Wilderness Society asked, in a statement to the MNR, that ecological integrity be the "overarching principle" used in the planning process. They also want the planning area to be expanded as it doesn't reflect the eco-region or the recreational district, but rather follows "simple bureaucratic boundaries." As a result, one remote park, Temagami River Provincial Park, is completely excluded. The groups call on the ministry to adhere to its own regulations and policies. Motorized access, which is prohibited in much of the region, has not been strictly enforced. Though the public believes the Lady Evelyn-Smoothwater Wilderness Park is a protected area, mining is permitted.